With Filth arrived in all its dirty, disgusting glory on DVD and Blu-ray, I caught up with Scottish director Jon S. Baird whose only previous feature film credit as director was the little seen biopic Cass. I asked Baird about what inspired him to make an adaptation of the Irvine Welsh novel, what it was like working with James McAvoy and if there is a possibility of a sequel. With Baird recently announced to be taking over from Danny Boyle on directing new TV series Babylon, I also picked his brains on what details he could spill on future episodes. 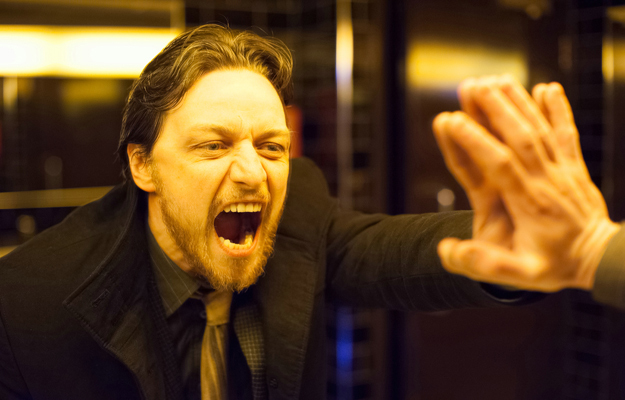 When did you first read Filth and when did you decide to adapt it? I read it the day it came out in 1998 and I loved it straight away. I wasn’t working in the film industry but then I met Irvine ten years later and I’d since read it four or five times. I just pitched him straight away. I said I’d love to do it, are you interested? We got talking and then he was hopefully impressed with the pitch I had and it went from there. I was just infatuated by the main character. How important was Irvine Welsh to getting the movie made? He was there to give support with his name and stuff. He wasn’t hands on but he was very supportive and particularly when the film came out in terms of publicising it, he was great. He’s a very close friend now so he was always there as a confidant as well. This is probably the most ever producers on one film… was it hard to get funding… even once you got this cast? Yeah it was tough to get funding. We were grateful to all the guys who put the finance in. A lot of the producers who are credited on the film, I haven’t even met before. We’re grateful to them because it was a very tricky one to get off the ground. Why did you decide to dial back Bruce’s physical disintegration from what happens in the book? I just didn’t think that was as interesting as the psychological deterioration. I wouldn’t be interested in going to the cinema to see somebody’s balls flaking off or haemorrhoids and stuff you know? I just wasn’t interested in that and that’s purely what it was. I just thought people aren’t interested or it would just be a wee bit too much for them. I think it’s much more interesting as a psychological thing. How did you lighten the tone of the film from the very dark book? There’s a lot of different tricks that you can use when you’re manipulating an audience. Performance obviously is one and humour is one and use of music. You don’t necessarily have to like someone but you have to want to follow their journey and I think that humour probably is one of the best ways. I think McAvoy just gets the balance right. How much direction did McAvoy need? Once he was cast he was fantastic. It was just before he was cast, we had doubts about whether he was the right guy. We rehearsed a lot but he’s a fantastic actor and a clever guy so he found it very quickly. How did you feel about adapting the book? Were any scenes sacred? Was there anything you were intent on changing? The two scenes that were absolutely sacred never made the film. I shot them both and they’re both on the DVD extras. One was Angus the dog and the other was the airport scene and they both made the extras on the DVD but never made the film. They were the ones that I thought were totally sacred, big set pieces. It just shows that sometimes you think it’s sacred then you put your film together and they don’t fit in there. With the tape worm it was just a case of personifying that with Dr Rossi and making it more accessible so you’re not heavily using the CGI or anything. I think this is a rare example of a film adaptation that is better than the source novel. 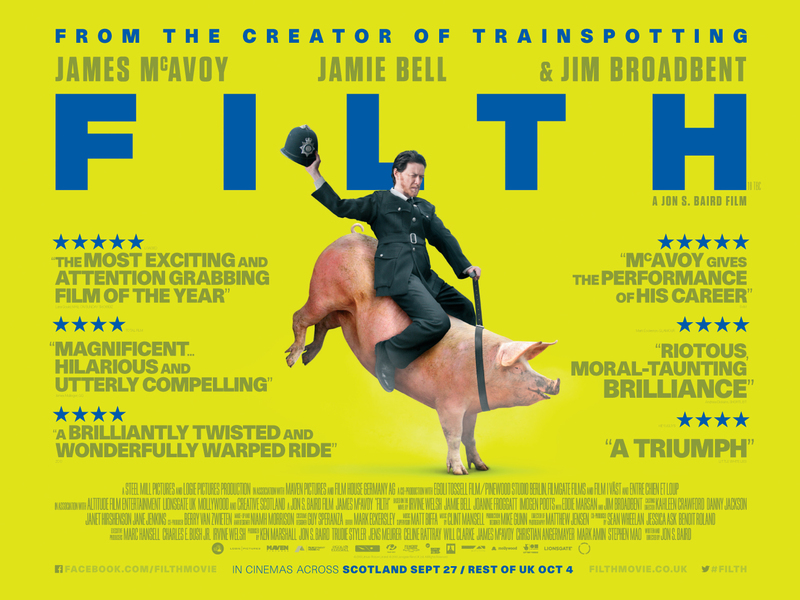 Were you inspired by any other adaptations when making Filth? A very good question. I don’t know if I was inspired by any other adaptations. I think I just loved the book so much that I knew it really, really well and I just knew what I wanted to do with it. I don’t think there was anything I was inspired by. Irvine actually said to me when he first saw the film, he said “I think it’s better than the book” and that was a very humbling thing to hear from him. Not even Danny Boyle’s adaptation of Trainspotting? You know something, I hadn’t even read Trainspotting by the time I started writing Filth. I read Trainspotting after I wrote the script of Filth so I hadn’t read the book. So I wasn’t sure of the adaptation and what the tone had been of the book compared to the film. Irvine Welsh has written a sort-of-sequel to Filth called Crime that follows Jamie Bell’s character Ray Lennox. What is the likelihood of you tackling an adaptation of that in the future? Yeah I think there’s a good chance of that yeah. Do you know when it might happen? No mate, I really don’t know. Not soon anyway but I think in the future it will. What can you tell us about Babylon? Well it’s exciting because it’s working with Danny Boyle. It’s a drama with comedy as opposed to comedy-drama I think. It’s a character driven piece and a very high level of casting and production value and written by the guys who did Peep Show. So I’m doing the first three episodes and starting to shoot them next month. The pilot is on Sunday (Feb 9th 2014) at 9pm so I’m just looking forward to that.